The ultimate sim racing cockpit in terms of adjustability, expandability and rigidity. The Sim-Lab P1 Chassis is highly suited for Direct Drive wheels and will endure a lifetime of sim-racing. The revised front mounting construction now features a 15 mm laser cut front plate which is extremely stiff. The wheeldeck supports all common racing wheels. In both cases the wheel can be adjusted up and down and tilted to achieve the exact right position. The overall rigidity of the sim rig ensures no force feedback is lost and remains crisp and vivid just how sim racing is meant to be. Pedal flex is absent which helps to get your muscle memory right in the zone. The pedal-deck can be adjusted by loosening the handles on the side and move it forward or backward. The dashboard wheel bracket can be suited to fit any Servo (Mige, Bodnar, Lenze, Fanatec CSW), see the pull-down menu on the right. Dashboard wheel bracket is not designed to be used with Fanatec CSL setups. The new design of the dashboard bracket features a 15 mm front plate which eliminates all flex even under the highest loads. With the side plates it can be adjusted up/down, front/back and tilted back and forward. The dashboard bracket provides more leg room than traditional bracket mounting, which helps improve comfort and overall improves the look of the cockpit. Pedal tray – The pedal tray can be adjusted forward and backwards. It is secured with the locking levers on the side. Also, it can be mounted with an angle, up to 19 degrees, to have the pedals slightly inclined if needed. Connector plates – The uprights are the main focus point when creating a rigid frame. The steering forces are creating a moment at the base of the uprights. Especially with the torque forces direct Drive systems are operating. To counter these effectively, a play-free connection of the upright is essential. These sandwich plates lock the uprights firmly into place. Because they are easy to install, success guaranteed. 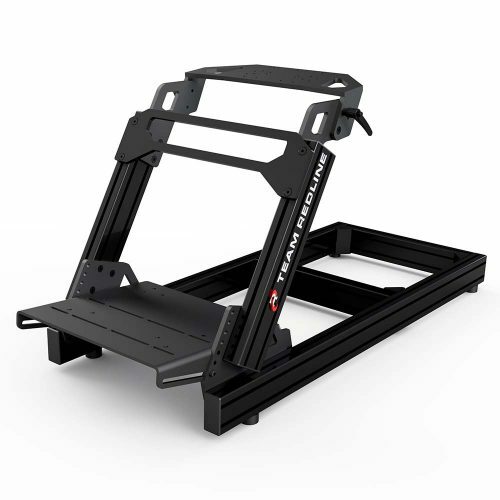 Side mount – Standard the P1 is fitted with a shifter/accessories mount, running from the uprights to the back of the rig. Can be mounted both left and right. In addition, extra 2 profiles are provided to add the possibility of multiple configurations. Spare materials – What is a rig without spare materials to tinker around? To be able to mount whatever you get your hands on after the build is complete extra materials are added, such as t-slot nuts, different types and sizes of bolts. Base structure featuring 160×40 mm aluminium profiles. Special sandwich plates lock the uprights from any movement. High-quality solid joints attach the dashboard bracket to the frame, making it easy to adjust height and angle of the steering wheel. 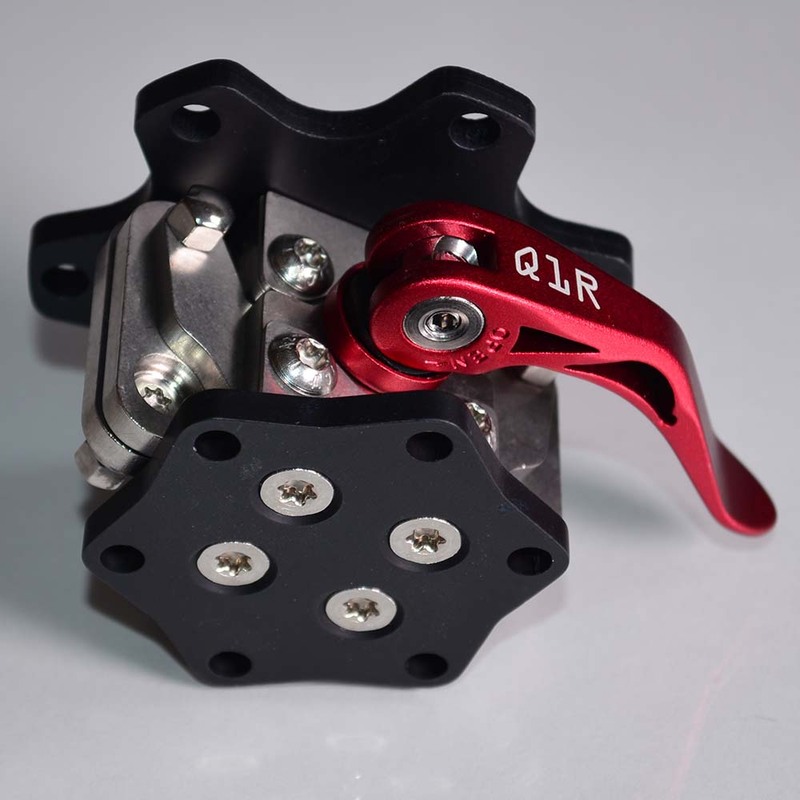 Dashboard bracket securely fixates you servo drive wheel or Fanatec base. Fanatec pedals can be mounted without additional hardware. Heusinkveld pedals can be mounted without extra materials, all bolts/nuts included. Heel plate can be purchased separately. Sim Lab P1 Cockpit Part 1 "The Build"
Sim Lab P1 Cockpit Part 2 "The Setup"